The Fuze Card smart card has the ability to store up to 30 credit, debit, gift and membership cards, any of which can be used via a simple set of buttons. The card sells for $129 and has a battery life of up to 30 days. What Is the Fuze Card? 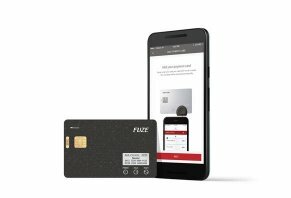 Fuze Card is a Bluetooth-enabled smart card that stores the information of up to 30 credit, debit, gift, and rewards cards in one place so you don’t have to carry a wallet. Payments are made by using the card’s menu to select the card you want to use, then swiping the card like a traditional credit card. The card and its technology were developed over several years and finally launched in May 2017. Fuze Card raised more than $2.44 million through an IndieGoGo campaign. What makes the Fuze Card an interesting option is that it’s one of only a few smart cards that has survived. Others like Coin and Plastc faltered and eventually went out of business. Is the Fuze Card a wise choice for you? How exactly does it work and what are its capabilities? Is it safe? These are the kinds of questions that are important as you decide if you really want to condense your wallet down to a driver’s license and this one piece of technology. We want to help you answer those questions through this review, in which we’ll cover how the card works, it’s main features and benefits, fees associated with the card and user reviews of the card. At the end of the review, we’ll talk about the card’s general pros and cons as well as who we think it’s a good fit for. The Fuze Card looks similar to a credit card but there’s a lot more going on inside of it. In fact, the card is a multi-layer electronic device with a paperwhite screen similar to a Kindle, a battery, a touchpad, a magnetic stripe and a small circuit board. According to Fuze’s website, the card’s battery lasts 30 days if you use it four to five times a day and charging the battery takes about 1.5 hours. All of these work together to connect to your phone so that you can input the credit, debit, gift and rewards cards you’d like to connect to the card. A promotional video from the company notes that you can pretty much add any card with a magnetic strip, including library cards. To do this, you need to use the Fuze app, called “Ecard Manager,” which is where you can see all the cards you’ve stored, add new ones, remove cards and wipe your card, if necessary (more on that later). To add a new card, you plug the Fuze card’s card reader into your phone’s headphone jack and swipe cards through. It may take up to two swipes for the reader to register the card. This reader will register your card number but you’ll have to manually enter the card’s security number and expiration date. Membership cards like a Starbucks card will have to be entered manually. According to Rashana Nary, a Fuze rep with whom we emailed, the company is planning on launching a new Fuze card that has NFC (touch payments) and EMV technology. Once you have your cards loaded onto your Fuze Card, you’ll start to get a feel for all the features the card offers, features which we’ll briefly cover in this section. As far as security goes, this is the premier function you need to know about. Using this tool allows you to wipe your Fuze Card clean of any card information it stored. Along with this feature, you’ll get location tracking, which will show you where your card is if you lose it or leave it behind at a coffee shop. Your app will notify you when you’re separated from your card. While not a traditional “feature,” convenience is an integral part of the Fuze Card. I normally carry around one credit card and two debit cards, along with a couple of membership cards (Starbucks, Sam’s Club). When it gets down to it, this advantage along with the remote wipe feature are the two crucial aspects of the card. If either of these doesn’t work well, then there isn’t much use in putting the Fuze Card in your wallet. Your Fuze Card has a small screen reminiscent of a mini version of a Kindle Paperwhite. It’s from this screen that you can select the cards you want to use by scrolling through what you added to your app. You can also use the card’s series of three buttons to create a password required to access the cards. Fuze leverages its YouTube channel to provide tutorials on how to connect your card to your phone, how to add cards and more. These simple, straightforward videos make it very easy to do the basics with the card. At the time of publishing, the Fuze YouTube channel had 13 different videos, five of which were tutorials. At the time of publishing, the Fuze Card cost $129, a price that also included the card charger and card reader. The charger and card reader were also sold separately for $14.90 and $9.90. Fuze offered a card sleeve for $3, too. Pro tip: Once your Fuze Card ships, you purchase won’t be refunded. However, it does have a 90-day parts guarantee in which faulty components will be replaced for free. In April 2018, a Forbes article revealed that a security firm was able to hack into a Fuze Card and steal credit card numbers registered to a Fuze Card. While the breach was purely exploratory and not malicious, it raised concerns that savvy crooks could compromise users' personal information. Around the time the Forbes article came out, Fuze posted a statement on their website indicating they would release new firmware that would patch up the vulnerability. At the time of publishing, Fuze had released the new firmware. A post addressing the update noted that, among other improvements, the card and app won't transmit full credit card information and that the card will automatically reset if the passcode is entered incorrectly five consecutive times. In our opinion, this new update seems to have solved the problem. But, as always, make sure you keep an eye on the transactions made with credit cards or debit cards linked to your Fuze. The multi-card industry is one that’s marked with failure after failure. As a result, there are only two other major card producers out there: Swyp and Edge. Of the three, Fuze is the only card that’s actually up for sale right now. The other two cards have yet to show up for sale and are still in the development stages – Edge card says they’re scheduled for release sometime in 2018. Swyp, on the other hand, actually was available for purchase in 2016 and 2017 but the company stopped shipping after that and has created a waitlist for the next product release. If all of this sounds a little disjointed, that’s because, as we mentioned earlier, the “smart” card industry is one in which it’s really difficult to succeed. Coin, Stratos, and Plastc are all cards that hit the market with a ton of fanfare and then either closed their doors or were bought out by a different company. Keep that in mind as you considering ordering a Fuze card; none of the smart cards we’ve reviewed have survived more than a couple of years. Now, based on our research, we think there’s nothing about the Fuze Card at this point that would indicate it will fail. Based on our research, we think there are some clear advantages to the Fuze Card. First, it’s the only smart card we know of that’s actually available for purchase right now. So, if you’re really captured by the idea of having one card house all of your credit, debit, gift and loyalty cards, then it’s an excellent product. Adding cards is simple and using the card at stores and various locations is as easy as using a credit card. We also like how the app will notify you if you’re separated from your card. As for downsides, we think that the fact that Fuze is the only smart card out there right now is also a bit of disadvantage because you don’t get the chance to comparison shop for features and pricing. Also, while we don’t see any major flaws with this card, the smart card industry has been notorious for sudden closures and disappearances. Keep that in mind when you sign up for this card. We believe this card is a good fit for someone who’s been watching the smart card industry and has missed out on other cards because they closed. If you’ve been dying to get one, this is your only option and, for that reason, it’s a good fit. While we think that the no-refund policy could be frustrating if you aren’t happy with how the card functions, the fact that the company will provide 90 days of parts replacement should give you some peace of mind. Six months and the card won't even get past the lock screen, no support. What a piece of crap. They have yet to send out the EMV-version of this card. No update except they keep pushing the date further and further out. I took mine out of my wallet and it is just frozen. NOTHING past the main screen. Charging it for days does nothing. They have NO tech support. NO ONE responds because there's not even an email contact. Their Twitter and other feeds haven't been updated since July. What a piece of garbage. Stay away. I couldn't get the card to work. I tried swiping my credit cards a dozen times to get the darn thing to load. So I emailed support for help. I live near their office and said I would drive over so they could show me how to set it up. No response. I VOLUNTEERED to go to THEM. Still nothing. The card is absolutely useless in Canada. All their advertising and propaganda illustrates Fuze Cards with a micro chip...the card arrives with NO CHIP. The card is only good for swiping, which is useless. I reached out to Fuze for a refund or at least a credit until the new cards are released...NO HELP. Nothing. Scumbag company. After having the Coin Card a few years, I'm used to getting the odd stares and ignorant comments (my favorite was "we don't accept bitcoin"). With the Fuze card, I was very happy to see great improvements - the ability to store more cards, use of barcodes and recharging capability. However, I find that my Fuze Card works much less frequently than my Coin Card ever did (this is with non-EMV transactions). Many readers just will not read the Fuze's magnetic strip. The best use I've had is with barcodes (and at Walmart). I have to say I've been a bit disappointed and not very hopeful should the EMV version ever be released. The card and tech are great, but it doesn't do much good if you can't rely on it to be used every day. I still have to carry most cards with me everywhere, so I'd have to say it's mediocre, at best. Still needs improvement. Like anything else, another tool to assist the criminal who can and will find a weak link. My debit card was used to buy a Fuze Card, it is believed to add a card that can be used to steal. I do not suggest anyone use these cards. This review is a bit unfair, it's like saying a data card printer is a tool to print fraudulent magnetic stripe cards to make fake credit cards, therefore the card printer should not be used. This fact does not deter anyone using the card, as it was originally intended. Write a Review for Fuze Card!